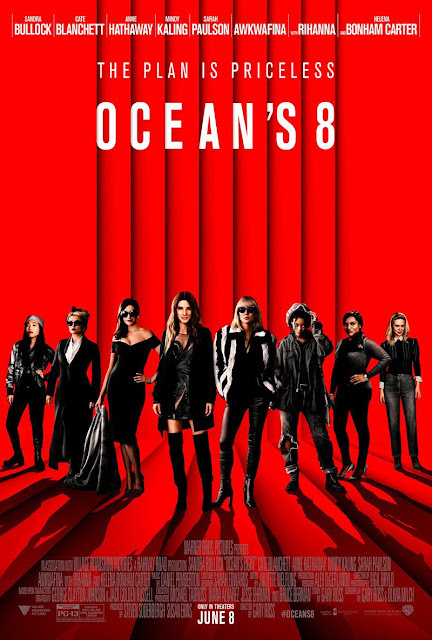 Ocean’s 8, the female centeric continuation of the Ocean franchise, is an enjoyable but safe reboot. Gary Ross tries his best to capture that cool vibe and spirit of the original film. He delivers a glossy fizzy film that that’s about as lightweight as they come. Sandra Bullock leads the film ably even if her Debbie Ocean is a far call from Clooney’s Danny Ocean. Bullock performance is fine but the film undersells its lead without much characterization, leaving her a bit of a cipher throughout. Cate Blanchett, ever the chameleon, is lots of fun as Bullock’s partner in crime. Blanchett and Bullock have some solid chemistry together and their plenty of fun when they’re plotting or interacting. The remaining members of the crew are all good fun in varying degrees of effectiveness. Anne Hathaway leaves the biggest impression with her self parody performance that people will either love or hate. Ocean’s 8 is never boring or uninteresting but it’s all so inconsequential that you’ll probably never think about it again.